After being together since the days he was still wearing a St. Vincent St. Mary Irish jersey, LeBron James has finally proposed to his high school girlfriend Savannah Brinson. Early this morning, King James made the announcement that he proposed last night. He proposed at a party celebrating the New Year holiday, as well as his birthday. LeBron turned 27 years of age Friday. Twitter was full of LeBron’s friends and fans congratulating the two time NBA MVP and his new fiancé. James and Brinson have two children together. The first child came into this world on October 6th, 2004 and was named LeBron James, Jr. The second son, named Bryce Maximus James, was born on June 14th, 2007. The family currently lives in a Miami suburb after moving there following LeBron James’ signing with the Miami Heat a few summers ago. No official date for the wedding has been set and no details on any plans have been disclosed. 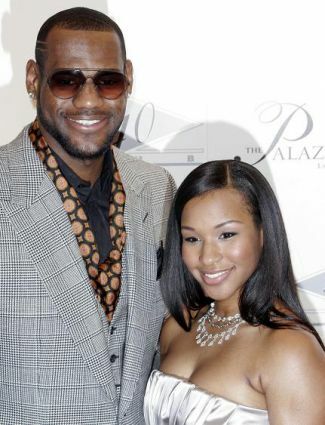 Most likely, due to LeBron’s tight schedule during the NBA season and playoffs, the couple will wed in the summer. It may have taken a decade, but LeBron is finally doing the woman of his dreams right and making her his wife.